Twitter is full of retweets (RT). From a simple click of the RT button to adding a personal note before sending it on to your followers, retweeting is one of the easiest ways to spread awareness, both of information and the people behind that information. It’s also an easy way to get more followers, because talking about other people’s content brings the love right back to you–which results in people retweeting YOUR content. If you’re trying to build engagement, getting retweeted shows you’re doing something right. What’s the first thing you (should) do when someone retweets your tweet? Thank them. What I see the most is the ubiquitous “Thanks for the RT!” reply. In addition to telling those retweeters that you care about their support, by replying to that person’s account, you’re also telling everyone else who comes across both your Twitter feeds that you care about engagement and building quality relationships, not just numbers. Amazing how a simple thank you can do so much, eh? While this is a very polite message, it raises a red flag with me. Since this is a private exchange, this method tells me that while you appreciated my retweet enough to send me a message, you didn’t appreciate it enough to tell your followers about me the way an open reply to my account would. Additionally, “return the favor soon” doesn’t mean anything unless the person actually returns the favor. In my experience, someone who writes this rarely does, or they’d do it, not say it. But that’s just my opinion. What do you think? Is there a place for the DM Thank You? Does it make a difference if that’s all the person ever sends? 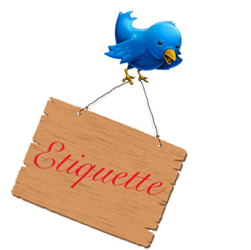 Pic from this great Twitter Etiquette post here–check it out. Nope, I agree. Not only it is more of a process actually sending a DM, but it is more polite and a virtual “shout-out” to do so. Huh, I wonder what happened in my comment and why it didn’t just give my name. Anyway, it was me. Strange things are happening this week in the blogosphere, I’ve found; I think my spam-finder is on hiatus. But I’m glad this time it was a real person–you!